The larger of two look alikes, the Hairy Woodpecker is a small but powerful bird that forages along trunks and main branches of large trees. It wields a much longer bill than the Downy Woodpecker’s almost thornlike bill. Hairy Woodpeckers have a somewhat soldierly look, with their erect, straight-backed posture on tree trunks and their cleanly striped heads. 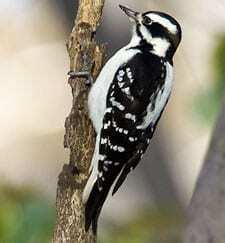 Look for them at backyard suet or sunflower feeders, and listen for them whinnying from woodlots, parks, and forests.